I came in a little past 7 to a semi-filled parking lot. My girlfriend and I had a great, quick dinner at Iguanas which is famous for their burritos. For those in the area craving a filling burrito before the tourney, I recommend Iguanas. Anyways, as we were walking in, there was a sign stating that SLR’s are not allowed in arena. I pretty much guessed right. I brought my SLR just in case I was able to take it in, but decided last minute to not take it with me. So I brought my trusty Pentax P70. 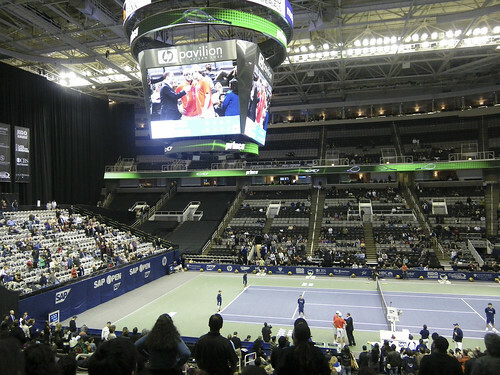 A view of our seats compliments of San Jose Mercury News! 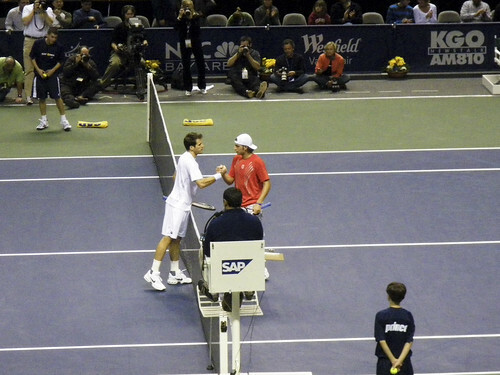 First match of the night was Tommy Haas vs. Devin Britton. I believe this match was not so entertaining sue to all the pounding serves. I think both players were aiming for aces all night. There were some good times when Britton tried to serve and volley. Haas was able to get some good net play. Hass won the match overall in two sets. A quick fact I found out was that Britton was a ball-boy for Haas years back at another tournament. I thought that was cool! 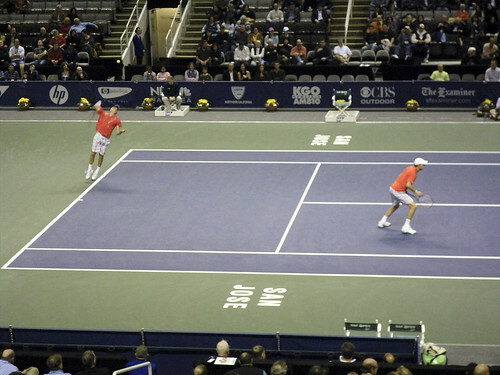 The next match up was the Bryan Bros vs. Colin Fleming and Ken Skupski. 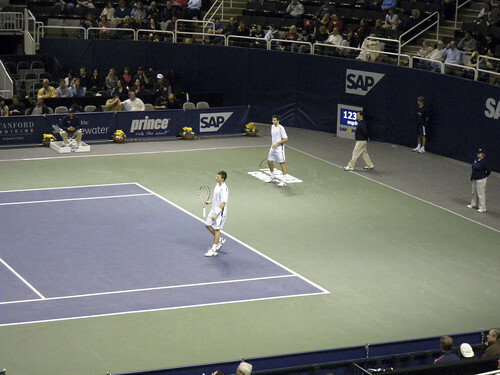 I have seen the Bryan Bros play before at the ‘08 SAP Open. 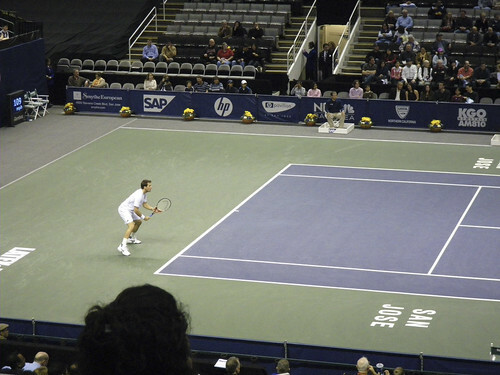 I always loved watching them play because of their GREAT volleys! The thing that amazes me is their SHARP reaction time. They are ready to volley line drive balls while at the net. Playing two back is not an option while playing against the bros. Their angles while at the net are superb. They are ready to end the point fast while leaving their opponents without a strategy. I did not get that many shots of Colin Fleming and Ken Skupski. 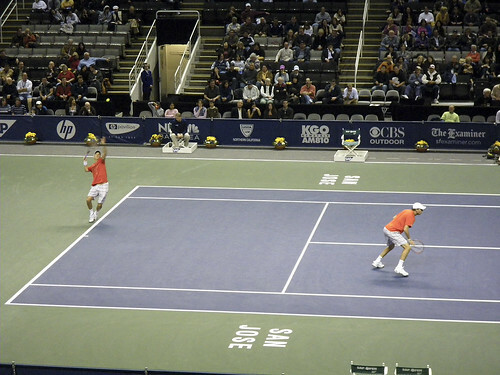 The Bryan Bros are my favorites. They eventually won in two sets. 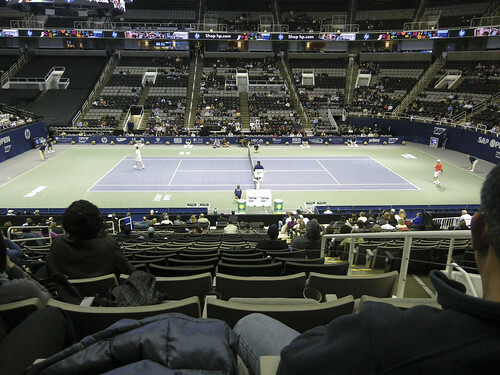 The last match was Sam Querry vs. Teimuraz Gabashvili. I was not able to get any photos of the match. BUT, I have some video that I will upload later on today. 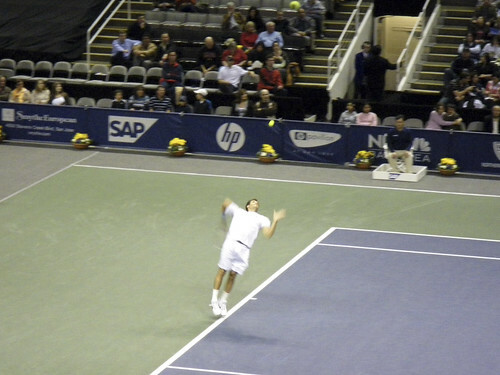 Querry ended the match in two sets. 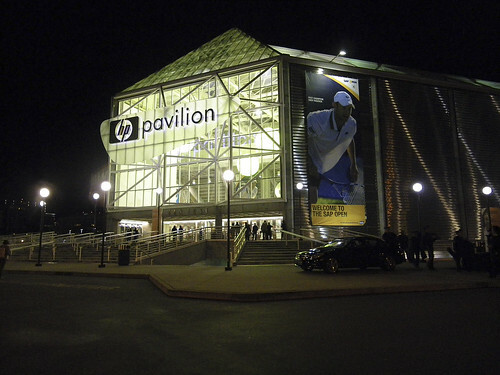 Tonight is Andy Roddick’s first match of the tourney. I just checked the results of the day matches finding out that Radek Stepanek, last year’s champion of the SAP, lost to Xavier Malisse. Seems like anyone could take it this year. 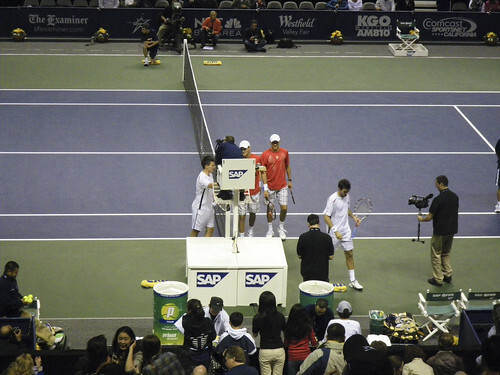 Hopefully Roddick’s arm lasts throughout the tourney. I will be attending Thursday’s day and night matches. I will give an update afterwards. CHECK OUT THE REST OF MY PICTURES FROM TUESDAY NIGHT. 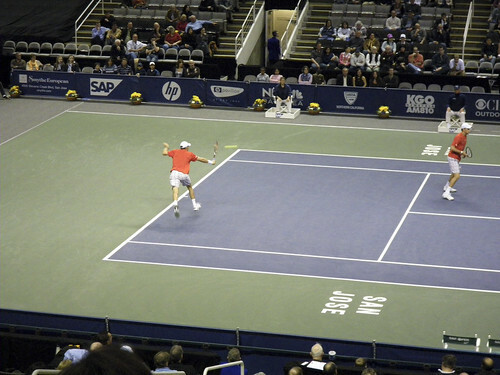 « TUESDAY SCORES AT SAP OPEN!